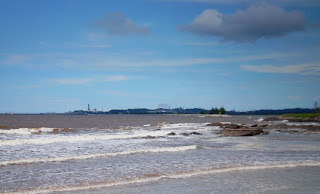 This is a view of the Kidurong Bay from the rocky beach of Tanjung Batu, Bintulu. In the far background is the Kidurong Heavy Industry area which nestles the largest LNG plant in the world ( in a single location). The distance from the beach to the tip of the Bay of Kidurong is about 10 km.